Here’s a reminder of the prizes and bonuses. Participating in #HAHD 5 is just one way you can set personal goals and stay motivated to write. Submitting more articles means more high-quality traffic driven to your links. Also, completing this Challenge will boost your reputation as an expert in your niche. You can stay up-to-date on everything related to the Challenge and keep others notified of your progress with the #HAHD hashtag on Twitter. Leave a comment to share your experiences of this #HAHD, past Challenges and how you stay motivated. Great to know that and now waiting for my goodies as my New Year Gift from EzineArticles … I set my goal as 200 but couldnt attain it and I’m happy that at least I have submitted 102 articles for now and qualified for being the first 100!! Great Happy New Year to All! Happy new years all !!!! Congratulations to all who have made it or are close to completing. I started late in October and completed my 100th article on 12/26/10. The HAHD was a great way for me to also write better articles, I finally qualified for Platinum during this time!! May you all have a great 2011!!! I’ve just 9 to go for the double challenge! I have really enjoyed the 3 challenges this year – they are great inspiration to be doing what I know I must do more of – writing plenty of quality articles. The prizes are a good incentive to write and the increase in traffic an excellent reward afterwards. Thanks to the editors for their speedy reviews and Jenna for sorting my recent problem! I started – and finished !!!! yay..
Congratulations to all who are meeting this deadline of productivity. Best wishes in this New Year everyone! I started – and finished !!!! yay. Congratulations to every one who completed the marathon! You are productive people. Best of wishes to all EzineArticles expert authors…You do greater things in 2011. Well… I started strong, and then that 4 letter word LIFE got in the way. Congratulations to those who made it. I myself started strong, business got busy, but still made the goal (had to submit over 70 articles in 5 days) because excuses are just that excuses. This is a viable marketing strategy, but only if you do it. Thanks to the great staff at EzineArticles for all of their hard work, their continued encouragement and how easy they make it to keep track. 5 Challenges done and completed. The sixth one starts in early January. I can’t wait for the next challenge. I started out averaging 6 articles the first 9 days but then I got busy. this next challenge I hope to write at least 500 articles with my goal being 1000. I love these challenges, they make you want to write more and more and seeing that bar on the side telling you how close you are to finishing is a great motivator. Someone’s godda ask: When will be the next hundred day challenge cause I can’t wait, soon? Russ, the next challenge starts on January 10th. Watch the Blog for more details. You used to put a little space between them it’s getting almost back to back now ha. thanks for getting back so fast on my question. EzineArticles is trying to keep us writers on the toes. Make the prizes more lucrative and you’ll see more winners in the next round. Wow! I got a late start but just finished my 100 articles. Thanks for the challenge. It gives us that extra push to do what we should be doing anyway! Congrat to everyone else who made it! Whew! Made it just in time. Business got busy and I got about 12 articles behind a month or so ago. In spite of my best efforts to catch up, I was missing whole days. Ugh! Then I messed myself up… a long story and I appreciate the EzineArticles staff for helping me get through it. That left me with 2 days to write 10 or so articles. Thank goodness no one was counting on me to get copy in for a deadline on those two days. I got those done, and wrote one more for good measure. Thanks as always for pushing us onward. Congratulations to all Expert Authors! Happy New Year to all! It is so awesome to make it again in a grand style.Starting my 2011 with a certificate of Achievement from EzineArticles Marathon Challenge is a good way to start my year as a burning and shining light…I am ready for the #HAND 6 come January 10,2011. It is so winsome to rule the world and so lovesome to write original articles that are changing the world. I am really living…Achievement is my lifestyle. Kudos to all Achievers. Yes, as soon all submitted articles are approved and the final results are tabulated, we’ll be announcing the 10 winners of the free Premium memberships. how we can see the over all performance of the contestants? this would be a good research point for self evaluation against the competition……..please make it visible to us. i wanted to hit 200……just got stuck at 198!!! Faisal, because of the delay between submission and publication (among other factors) we haven’t yet tabulated the final results. Once we do, we’ll be making that data available to our members. What does one get if they submitted 500 articles? A hearty congratulations for a job well done and a HUGE amount of laser-targeted website traffic, increased credibility in your niche and a boost in media exposure. What more can anyone ask for!!! But I will ask EzineArticles folks to consider this as a milestone target. it was awesome to realize that one can achieve 100 articles in 100 days. i thought i could meet the 200 target but i am absolutely trilled to be among those who completed 100. what with the added incentives, i cant wait for january 10th to commence the 6th HAHD Challenge. Wishing all EzineArticles staff a wonderful 2011. You all deserve some praise. To those who couldn’t meet up with the challenge, there is always another opportunity. Though I could not complete the Challenge, yet it has given me tremendous zeal and instigation to write. I am waiting for January 10 to start again with success. One THING more, your prizes are great source of inspiration, especially THE CERTIFICATE. I have the “download your certificate now” link active in my dashboard. Does this mean that I have qualified? Yes. :) It looks as though you met your personal goal as well. OVERACHIEVER! That’s awesome! Mah, once the final approvals are done and I get the reports I need, I will personally look into this for you. We expect to have everything finished by the end of this week or early next week. Mah, I looked into this and can clearly see that you did submit 100 articles in the #HAHD 5 time frame. You will receive your goodies as promised – they’ll be sent out within the next few weeks. Yay!! Thanks a lot for confirming this, Marc. I will await the packet and in the meanwhile gear up for the next HAHD. Is this something I need to question, or just a matter of timing? I know I got 101 articles done by the deadline. Now that the challenge is complete, you would no longer see the progress bars in the left navigational pane. However, you can still download and print your certificate of achievement by clicking on the “Author Tools” menu and selecting “Accomplishments”. You’ll also be able to sign up for #HAHD 6 in the left nav a little later today. Sorry to bother you again, Marc. But it seems like I would have to do without the certificate this time. Can see only the old certificates in the Author>Accomplishments menu :( I assume my details are still not updated. Keep watching it, Mah. It should update when your final article gets approved. I think I should give up the cause now. Mah, you may want to look again, there may have been a delay in the system – or perhaps refresh your browser. I verified that your account does show you as an #HAHD qualifier and your certificate is ready to be printed. Yippee!! I see it now. Thanks Marc. And yes, I will sign up for HAHD #6 too. Interesting to read all the comments. I signed up for 100 articles and did 103. It was not easy, but not too hard either. It’s a matter of discipline. Sometimes I couldn’t do an article a day for 4-5 days and had to catch up right away. It really kept me on my toes, let me put it this way. It was a great challenge and I thank EzineArticle for doing it. I can imagine how busy you editors must have been — it was a challenge for you too, no doubt. What was the cut-off to be in the top 100? The cutoff was 156 articles. Marc, do you mean whoever submitted more than 156 articles are in the list? Or there was a lottery? wow..now i have to type ‘research’ to post the comment!!! strange!!! now it says ‘platinum’ to type!!! wheeehaaaaa !! just received my gifts!!! Thanks a lot for this marathon! I just received my gifts:) I must say that I’ve learnt a lot from overcoming the odds in this event. For this, I really have to thank EzineArticles for giving me this chance to challenge my limits! 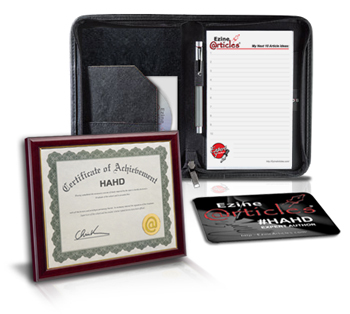 How many of the HAHD5 qualifiers have received their gifts? Is there any one like me who has not yet received anything? I do not understand why the qualifiers do not receive their gift tracking numbers? We can then keep eyes on it and help the courier to make their way, faster, correctly? After submitting 100 plus articles, is it much big expectation to receive the parcel tracking number? Or we are just putting more burden!!! Do not know – i am participating in HAHD6 and inspiration going down now!!! What a luck…to post this comment i need to type ‘speed’ in the box!!! Faisal, I apologize for the delay in receipt of your gifts. Please understand, however, that we have to wait about a week before we can even begin processing the gifts to make sure all qualifying articles have gone through the approval process. Once we have our list of qualifiers, it takes another week to process and package nearly 300 pieces of mail. Once sent, via USPS, it can often take 1-3 weeks to reach an international location such as yours. Since we ship USPS Priority Mail, there is no tracking code generated, so we are unable to provide that information.